Shifting got hard after changing gearbox oil. So the title basically says what happened. I have a 3rd gen and it's been a bit sticky going into first particularly ever since I got it. So yesterday I figured I would change the gearbox oil and hopefully that would help smooth things out a bit. I looked up the proper oil to use on Mitchell's, 10W30 or 10W40. I used 10W30. When I pulled the fill plug, i stuck my finger in, bent it, and couldn't hit oil, so it was pretty darn low. Then I drained it. The oil was completely black, so probably hadn't been changed ever. I filled it up with just under 2 liters of 10W30. Now every time I go to shift into 1st, I have to push crazy hard. It doesn't grind, or make any kind of bad sounds, it doesn't feel like anything is grinding when I'm pushing on it, it just feels like there's a lock or something that I have to overcome. Any ideas? Do I need to redo it with some special Honda formulated stuff? 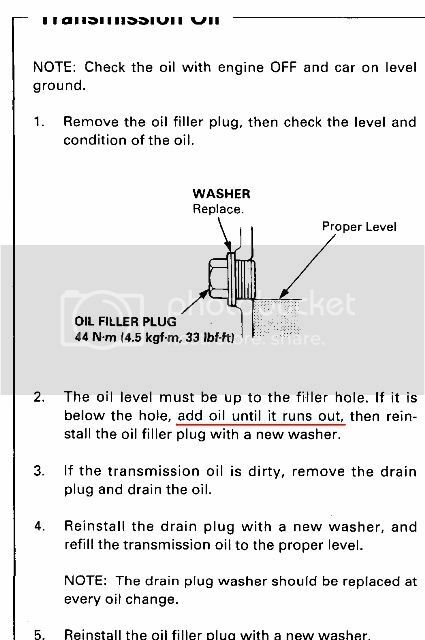 Or just put up with it and it will get better once the oil gets dirty and closer to what the gears are used to? I dunno, just wondered if anyone had any thoughts. Thanks a lot guys! Re: Shifting got hard after changing gearbox oil. you want to fill it so that it just starts to pour from the fill hole. i think honda does make a fluid but its not necessary, as the manuals just call for sf, sg, or newer grade motor oil, although i'd imagine the honda stuff is better. did you take note of what the old fluid looked like? Last edited by hojemwod; 10-04-2009 at 11:36 PM. The old stuff was black as could be. Looked like just really dirty motor oil. And yes, I filled it up till it was pouring out of the fill hole. Have you gone 100 miles yet since the oil change? My 5th gen was doing the same thing after my gear oil change. About 100 miles later will I was driving it was like a flick of a light switch. It went from **** to the best its ever been. I dont know why, but who cares its great now. Hope yours does the same. Yah, I drove it this afternoon and it seems to be loosening up a bit now. I've only put on maybe 30 km max since swapping the oil. I'll wait till 100km before worrying about it enough to put in Honda specific stuff then. Thanks!